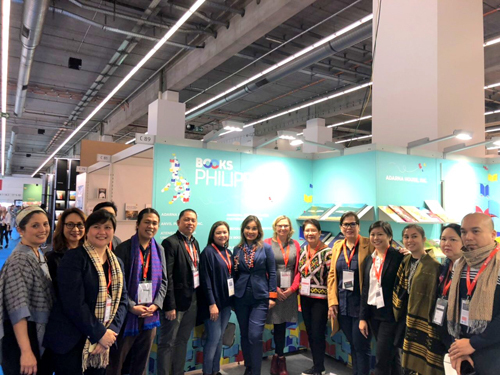 Frankfurt Book Fair: Senator Loren Legarda with Frankfurt Book Fair Vice President for Business Development Claudia Kaiser (9th from left), Consul General Evelyn Austria Garcia (11th from left), and the Philippine delegation to the 2018 Frankfurt Book Fair led by NBDB Chair Neni Sta. Romana Cruz (10th from left) at the Philippine pavilion. Legarda said that the Philippines needs to sustain its presence at the FBF and aim to be the Guest of Honor country in 2024.